“You’re a machine,” people have told me. 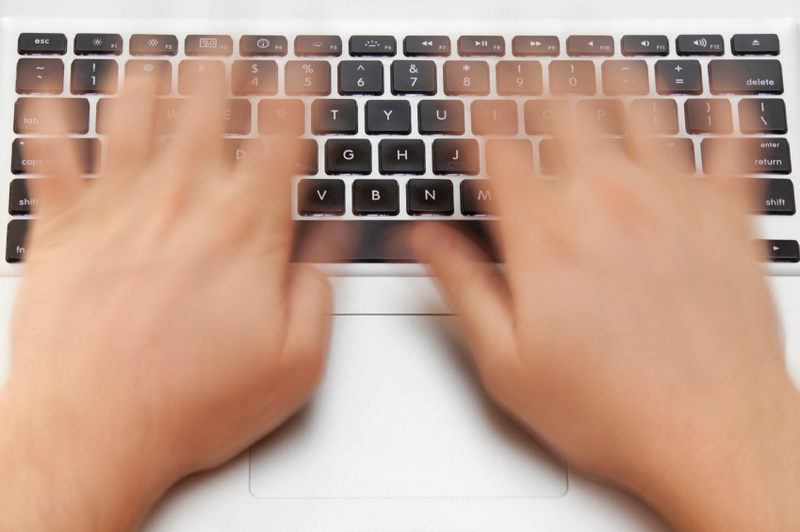 “How do you write so fast?” I’ve been asked. Well, today I’m going to tell you how. Let me start by saying that what I do may not suit everyone, it is just the way I work. If you can take something helpful away from my process to help your own writing, then that’s great. If not, then that’s perfectly okay. I’ve been writing seriously since late 2009, so in a few months time that will make it five years. I’ve written six novels, three novellas, two partials/proposals (synopsis and three chapters), and a few short stories. Three of my novels are published, one is contracted (and another but it isn’t written yet), the other two novels are on submission. Two of my novellas are published, the third one is contracted. I self-published one of my short stories, two others are provided free on my website and the others are hiding away on my computer till I figure out what to do with them! The first novel I wrote took me about a year. I’d heard that was an average time frame. But I want to write faster, I thought. My second novel took me nine months (ironically, the storyline touched on pregnancy), and my third novel but first to be published (Fast Forward) took me four months. Hmmm, if I could decrease the length of time it took each time, how fast could I go? Obviously, you can’t whip up a novel in a couple of days and nor would I want to. But my fourth novel took twenty days to write. Not consecutive days, but twenty days of actual writing over about two and a half months. The book was only 52,000 words, maybe it was a fluke? Nope, my fifth book which was 84,000 words took twenty-seven days and my sixth book which was 70,000 words took twenty days. Again, these weren’t consecutive days – I didn’t write for twenty days straight, and nor did I write all day, but I started this sixth book on 20th Jan and finished on 28th Feb, so just over a month. Sometimes, the steps might overlap as I go back and forth with new plot ideas or if I feel like I really need to edit and perfect chapter five before writing chapter six. The most important part for me is the planning. Yes, my name is Juliet and I am a plotter. If you’re a pantser and rolling your eyes right now thinking, ‘Oh, she’s one of them, this article is obviously not for me’, hang in there a moment. I didn’t always plot a lot. And sometimes, I even pantse myself, but I’ve learned that for me, plotting reduces how much editing and revising I have to do. This is good for me, because out of all the steps involved in writing it’s doing the actual writing that I enjoy the most. Some people say they like ‘having written’ but not the actual writing. I like having written too, but I love the writing itself – fingers typing away madly on the keyboard as ideas and thoughts scramble over themselves in an effort to be born onto the page. That makes me feel alive and powerful, gives me a natural high. Did I jot down a plan for this blog post? You betcha. Just a few notes in point form, but I know what I’m going to write and what comes next, yet still I can pantse and type whatever comes into my head. A plan for me is not a strict guide to follow or else, but provides a framework to keep me on track. I usually start by visualizing the story in my mind. Much of the work is done before I put pen to paper (or fingers to keyboard). I have to feel the story before I can write it. Luckily, I was always good at daydreaming, so this is like having a 3D high-definition movie playing in my head, minus the costly ticket prices, popcorn, and tall person in front blocking my view. I also like to start with a title and a one sentence or one paragraph pitch or blurb so I know what the main premise of the story is. If you can get the story down to a paragraph, it helps you stay focused as you write and not waste time writing scenes that don’t move the story forward. John and Jane bump into each other at a café (not literally) and swap phone numbers, they see each other again the following week (what will they do? Where will they go? ), sometime later in novel they will talk about this day and reminisce, but before then some interesting stuff needs to happen (like what? What the hell is this story about? ), and maybe they will be witness to a crime and then have to go on the run, some exciting stuff happens when they are on the run, and some romance, and they call a friend for help…but how will they charge their phones when they are on the run? Mental note: make it so the characters can at least grab their bags and phones and chargers before they go on the run… etc etc. This is just a silly example but hopefully you get the drift. Sometimes this is one page, sometimes it’s eight – whatever works. This aint’ no synopsis, this is when you can let loose and spill it all onto the page; big things and little things, plot twists and even what the character ate for breakfast if you like (this is a vomit outline after all). For the 70k story I wrote in 20 days (Haunted Ever After), the timeline was easier to plan as the story was only set over five days. In the table, there are two columns and one row for each day. If your story is set over a year, you could have one row for each month. In the first column of each row I list the day/date and I leave the second column blank. I make sure I’ve allowed enough room for each day and then I print out the table. Look at your vomit outline, however gross and messy it may be, and take the key points/plot events and write them into bullet points in the appropriate day/month of your timeline. In pencil is best as you might rearrange them later. (It’s just struck me now that some writers use Scrivener, a writing program, which probably does similar things to this. Again, whatever works for you. This is what works for me). By the end you should have a list of general bullet points for every day/week/month when something takes place in your story. Eg: John has dinner at Jane’s house, John and Jane witness a crime…etc. Now you have a schedule to follow when you write so you are not left wondering ‘what am I going to write about in this scene?’ Your story is mapped out and you are ready to write. *Note: I usually write chronologically, but with this method you can take any scene from your timeline and write it when you wish. If you want to write the end first, go for it. If you want to start from the beginning, go for it. I decide how much time I have available for writing (eg: 30 mins, 2 hours), and get comfy. I have my writing instrument of choice (see below), my timeline, pen, and post-it notes on hand, as well as a timer. I decide what scene to write from my timeline and pick one of the bullet points. Then I break this down into more bullet points! This doesn’t take long, and I only do it just before a writing session. 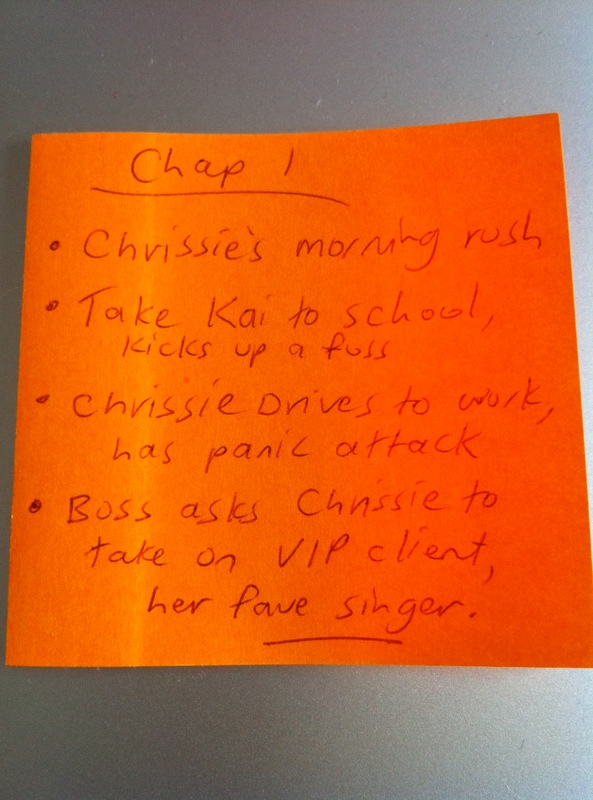 I put these new bullet points onto a post-it note and stick it beside my screen. Each point is one ‘thing’ that happens, even if only small. Jane opens the door and John gives her flowers, Jane sneezes. Jane serves dinner and realizes she forgot that John is vegetarian. Jane and John share awkward conversation. They hear yelling outside and go to the window to look. Now that I know what’s going to happen I can type madly, turning the events into a cohesive scene. But first, SET A TIMER. This is what helps me write extra fast! Even if I have two hours available to write, I’ll only set the timer for 30 or 60 minutes. Then I’ll reset it. I’ve found that a shorter time limit makes me write more words. While the timer is running, the only thing I do is write. I don’t worry about what I’m writing, I have my plot points on the post-it next to me so I know what needs to happen, and the writing itself can be fixed up in edits later on. No checking emails or social media, no answering the phone. YOU ARE WORKING! You are currently unavailable and in an appointment. That is how I view my writing sessions. If you were serving a customer in a shop would you stop halfway through their purchase and say ‘hang on, I just want to check this Facebook notification’? No. Treat writing like any other job. You can check your messages when the timer is up. Following this method, I can usually write between 1200-1500 words an hour, sometimes up to 1800. So if my word goal is 3000 words a day, this would only take two hours. *Note: Here’s a little secret that has had a BIG impact on how fast I write: I don’t always write on a computer! 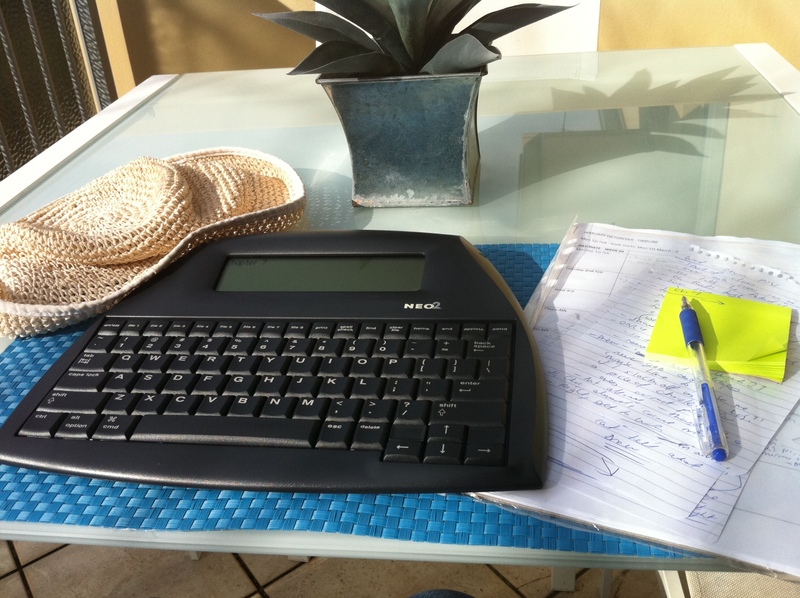 I share my writing between my Macbook Air, and a nifty little device called an Alphasmart NEO2, or NEO for short. It’s a lightweight portable word processor that runs on AA batteries (which means no charging or running out of battery while out and about – it took over two years before I had to change my NEO’s batteries!). Apart from the battery life, the other benefits are that it has a small screen that only shows a few lines of text so you have less temptation to re-read what you’ve written while writing, the screen isn’t backlit so you don’t get sore eyes (it’s that old fashioned black text on a greyish-green screen), and there is no internet! On this machine, you JUST WRITE. Also, it saves automatically as you type (even if you turn it off, you can turn it back on and resume where you were without losing anything), it turns on in an instant so there’s no waiting for things to load, and when you’re done you plug it into a computer via USB and can import directly to a word document (the words will gradually appear while it transfers) or save it as a text file and copy/paste into a word document. I LOVE IT. I also find the small layout really easy on my hands for typing and to get comfy with it on your lap. And it doesn’t get all hot like a laptop. Plus, if you accidentally leave it in your car no one will steal it because they probably won’t know what it is and think it’s an old, outdated piece of junk! Sadly, the supplier I bought my NEO from has said that they are not making them anymore due to everyone using iPads and whatnot. I would still prefer writing on my NEO to an iPad. I wrote my last novella on my laptop and found that I was nowhere near as fast as on the NEO. You should still be able to buy them from eBay or Amazon though (might be second hand), so if it sounds like something that could help you then do a search online and see what you can find. *Another note: I usually write while lying down (except when I write at cafes!). Bit hard if you’re using a desktop computer but if you write with a laptop or NEO, try it! Don’t know if it makes a difference, but it sure helps me get comfortable and makes sure I don’t get up and do anything else when I should be writing! Maybe it’s a blood flow thing too, who knows? If I have time, either right after a writing session or at the end of every day or two, I’ll do a quick read-through and tweak of the chapter/s I’ve just done. If I’m writing a novella I’ll usually just leave it all until it’s finished, but I find with a novel, doing this helps remind me of certain plot points and characteristics to help me stay focused and write the later scenes. And it’s good for picking up when you’ve accidentally changed someone’s name or hair colour. By doing the above, and by doing the detailed planning and plotting before writing, I’ve found there isn’t usually a lot to be done with editing. This wasn’t true for my first and second books when I was just learning the ropes, they required A LOT of revisions (and I’m still going back and forth revising that first book each time I get new feedback). When the manuscript is finished, I can usually do the edits in a few days. First, I go to my trusty list of overused and passive words and search for each in my manuscript, deleting them or changing them to something better. As I do this, I often find little things to adjust or improve in the narrative or dialogue, and doing little tweaks out of order can be helpful because you are not involved in reading the story at this point. When I’ve cut or changed as many of the passive words as possible, I do a mental checklist on the story and characters, making sure I haven’t forgotten any important details and seeing if there are ways I can enhance their characterization in subtle ways through their appearance, word choices, and behavior and body language. Then I read through the manuscript from beginning to end and tweak anything else that’s needed as I go. I try to set aside a good chunk of time to do this so I can read the whole book in a day or two, which makes it easier to pick up on inconsistencies and repetition. Done! I send to my critique partners if there’s time then do another edit with their feedback, or I send to my publisher and await the final verdict. >> For my 70k in 20 days manuscript, Haunted Ever After, I kept track of when I wrote and how many words I wrote. I started on 20th January and finished on 28th February, and wrote on twenty days during that time. My word counts ranged from 1300 a day to 5000 or 6000 a day (but most were around the 2000-3000 mark), reaching a grand total of 70 227 words, and getting it sent to my publisher on deadline day. >> My 84k in 27 days manuscript was written in a similar way, starting on 1st July and finishing on 7th September. Does writing fast lead to a reduction in quality? I’ll let you be the judge! My 84k book February or Forever was published last February and you can check it out here. If you don’t know me well you might be wondering if I have a lot of time on my hands to churn books out. No, I’m a busy single mother with a son with special needs. For the last four years I played teacher and helped him through high school via distance education, while also running an online business and writing my books. We’re all busy these days, but if you’re passionate about being a writer, you will make time to write. Life gets in the way for sure, and I certainly don’t write every day because some days it is just not possible, but I try to not let too many days get away from me. I also try to remember my priorities. If something can wait for another day, I let it wait. My priorities lie with the wellbeing of myself and my family and close friends, my responsibilities to my publisher, and then with others. Don’t let little things waste your time, and be kind to yourself. Allocate time to write when you will refuse to get sucked into demands from others (unless you have a young baby or child or other urgent reasons, then you have to be creative with your time!). Make writing a priority and don’t be hard on yourself when you get to the end of a hard day and haven’t done any. Go to sleep, start again tomorrow. Another thing that helps me write fast is that I have a lot of determination to succeed in this industry. It’s my passion, it’s what I want to do with my life, so I treat it with the importance that it deserves. Having dreams and clear goals can help you get your books written faster, especially when you have lots of other ideas you want to write about! Knowing that when I finish one book I can start on another I’ve been dying to write keeps me going! …So think about what you want to achieve with your writing. If you want to write at a leisurely pace at the end of the day for your own enjoyment, whether or not you get published, then writing fast may not be a concern for you. If you want to be a prolific author with multiple books published and make a full time career out of it, then learning to increase your writing speed will help you greatly. This doesn’t mean you should rush, just be efficient. Try some of my tips if you like, see how they go, and remember that it is okay to do things your own way. What I do may not work for everyone, but I hope that it will help at least one of you out there to maximize your writing time and get more joy and satisfaction from bringing your ideas to life. *P.P.S – UPDATE for 2016! – Since this blog post was published, I’ve continued my rapid writing to have 15 books published, and 18 written. I’ve increased my highest word count PB to 2000 words per hour. I still set a timer, and I still use post-its, however I sometimes write on my Macbook Air laptop instead of the NEO because it is light and has great battery life, and when I was writing my 5 book YA series I found I needed my series files open while I wrote to better handle the overarching plot as I had to keep referring to things that had happened. So it’s a mater of what works for you with each particular book. I still find the NEO the fastest way to write. Posted on June 14, 2014, in General, Writing and tagged Alphasmart NEO, How to write a novel, how to write fast, plotting, speed writing, tips for writing fast, writing, writing fast, writing process, writing tips. Bookmark the permalink. 35 Comments. Wow! Seriously impressed with your word count 🙂 this is highly motivating! Thank you so much for this post Juliet. You’ve really helped me pull my techniques together. What I do now makes sense to me! X Angelina. Great post, Juliet. I’ve found it very valuable. Excellent post. I too love the benefits of the Alphasmart – it’s especially good for writing outdoors, too. Sorry to hear they’re being discontinued. I’ve found the timer thing works well, too. But I’m not up to your level of productivity…yet! You’re a jewel to take time to share these with us! Thank you! Thank you! Thank you! Great post–very inspiring. I am a panster, but everything you wrote makes a lot of sense. I may have to give your system a try. Careful–your enthusiasm is showing. I love this post. It has inspired me to write more efficiently. I am also a planner. Scrivener really helps with this. I recommend it highly. Great fun and informative post, Juliet. We work in similar ways. I’m a plotter, too. I know – sad, but effective. 🙂 I’ve had an Alphasmart for about 15 years and it’s also great for typing up research notes. I use Windows’ Sticky Notes for scene-by-scene plotting and spread them over my desktop which can be shuffled around them dumped into a Word doc. Come back and let me know if any of the tips help! Great post Juliet! For someone like me who’s so time poor (full time day job + renovating a house) this post is proof that a lot can be achieved in a little time. I like writing in a notebook by hand for the reasons you like the Neo, except obviously that means typing up my notes but I use that as a way of editing. Thanks. Yep, it’s all about being efficient and taking opportunities. I also write on ad breaks if I’m watching a TV show, then sometimes I get carried away and write through the show and realise my imagination is more fun, hehe! If you need a process, give this one a try. It’s perfect if you’re a procrastinator. That’s amazing and you’ve really taught me something. I wrote over 6000 words long hand over a two day camping trip. It taught me one thing – the Internet can get very distracting. Because I write historicals there are some gaps that I have to research but it did remind me of the need for self-discipline. Juliet, you’ve inspired me to get my 25K done in the next 10 days. Thanks so much for sharing this. I was wondering how you write so much! You have some really great tips that I’ll have to try out. Again thank you, it was so insightful and inspirational and just what I needed to read at the moment. Thank you! It’s great to hear that it has inspired you. Wishing you lots of words! Great post. I sometimes write lying down too. I read somewhere that some people do better studying lying down and others sitting up. This might apply to writing too. This is a very interesting post by Juliet Madison. I have to admit that I’m a ‘panster’ if I’m to go by this post, or as Brandon Sanderson says, ‘a gardner’. Writing faster IS possible, the first step, is to PLAN. This is a fabulous post which I referred to after I realised I need to overhaul my writing system as it just hasn’t been working and I’m just getting further behind. Am definitely going to be putting your advice to work. 🙂 Thank you for posting this. This is so cool and so very helpful, looking into getting an AlphaSmart. I think that if I could type without seeing what I’m typing would help a lot. Sadly the Alphasmart appears to be no longer available. I have one – many years old – and it is invaluable for research notetaking which is easily transferred via usb to laptop. This is awesome! I tried pantsing in the past, and it didn’t work out so well for me. I’ve started outlining exactly the way you described, and it seems to help a lot more. Thank you for sharing! Second day of NaNoWriMo. Bring it! Yep! This article really spoke to me. I used to be a pantster with an idea of where my novel was going. This year, on a guided retreat, I plotted my novel. I defined the theme and I knew where I was going with it. I’ve produced the first 25k words much more quickly than with previous novels. PLUS, I too have started using my Alphasmart Neo in earnest. I’ve had it for years, but the fact it has no internet connection, is lightweight, uses batteries and can be used in glaring sunshine are all huge advantages. I can take it anywhere – and do. Also, when I ‘play’ the text into my document on the laptop, I can read it as it flows in. I recently recommended it to a friend and she bought one off e-bay. Thank you Juliet for generously sharing such essential and enlightening advice! A very interesting post Juliet. I’m going to give your way a go and see if my word count improves.